Over the years, some photos and articles have been published of what appears to be a Marbon CRV which had been created by the Italian coachbuilder OSI. The car was tastefully modified in the headlight, hood, windshield, and trunk areas and was said to feature Renault running gear. However, there was never any reference to how or why the car was built. Did Marbon Chemical hire OSI to build it? Did OSI see one of the CRV's and purchase parts from Marbon to build their own version? Whatever happened to the car? These are some of the questions that has burned in our brains for years. Finally, someone who knows the answers has come forward. Guus Bierman worked for Marbon Chemical in Europe during the 1960's, operating out of Geneva, Switzerland, and Holland. His task was to develop applications for vacuformed and injected plastic in the automotive industry for the European market. During his time at Marbon, he even traveled to the USA and met CRV designer Dann Deaver, Trant Jarman, and Forbes Howard. In 1966, Centaur Engineering completed CRV-V and Marbon shipped it over to Europe for a promotional tour. Guus took the car to every car manufacturer in Europe to tote the possibilities of plastic for automobile manufacturing. Of special interest was Italy, where most of the exotic car designers resided. During a visit to the prototype studio at OSI, one of their engineers crashed the CRV-V heavily and it was no longer drivable. Subsequently, the car was returned to the US to analyze the impact absorption of the Cycolac. Sensing how badly they felt about wrecking the car, Guus convinced OSI to construct a European version of the CRV. Marbon supplied the two-piece Cycolac body and a fiberglass chassis. Through his close contact with Renault, Guus obtained running gear from an Alpine Gordini. The inline four cylinder and five-speed gearbox was much lighter than the Corvair package which made the car very fast and well handling. 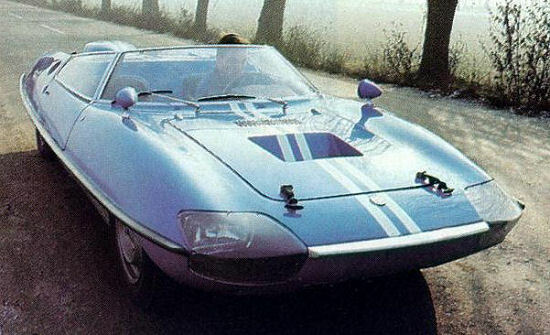 The car was finished as a convertible "Spyder" version and was painted French Blue with white stripes. 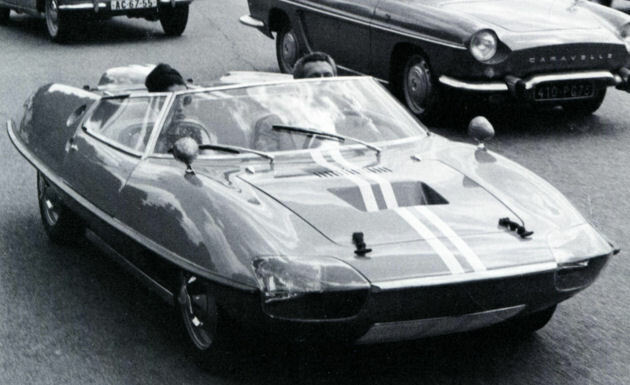 Upon completion, Guus personally drove the car over 5,000 miles around Europe promoting the car and the products. After the novelty of the car wore off, the car was stored in the Marbon factory in Amsterdam. Guus left the company in 1971 to start his own business, and years later a Marbon employee obtained the car and modified it for racing in Holland. Guus has seen pictures of the car racing at the Zandvoort track in the Netherlands. Unfortunately, Guus had not been able to locate the car for us, but he hopes to furnish more information in the future. Special thanks to Guus for writing and filling in one of the many gaps in the CRV/Piranha history!